If you are an artist, you need to find the right platform to showcase your talent. 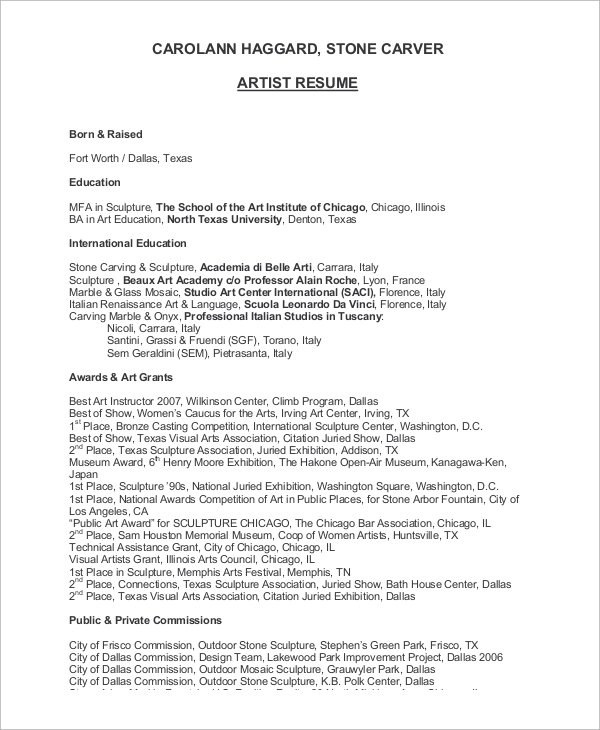 A sophisticated Artist Resume helps you to get closer to the dream organization you wish to work for. If you are a designer, painter, actor, or wants to be a part of the arena of art, you need to find the organization which recognizes and respects your talent. 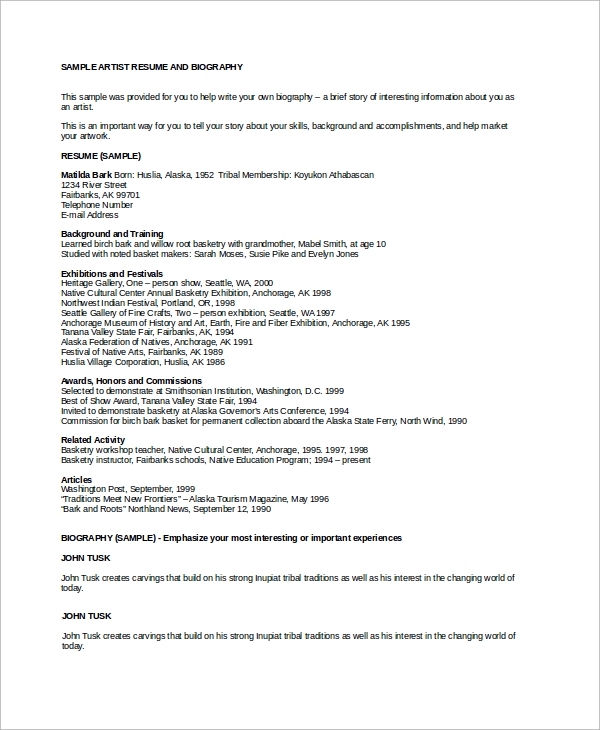 Here are some Sample Resumes for you to check out, and you can follow any of these formats. 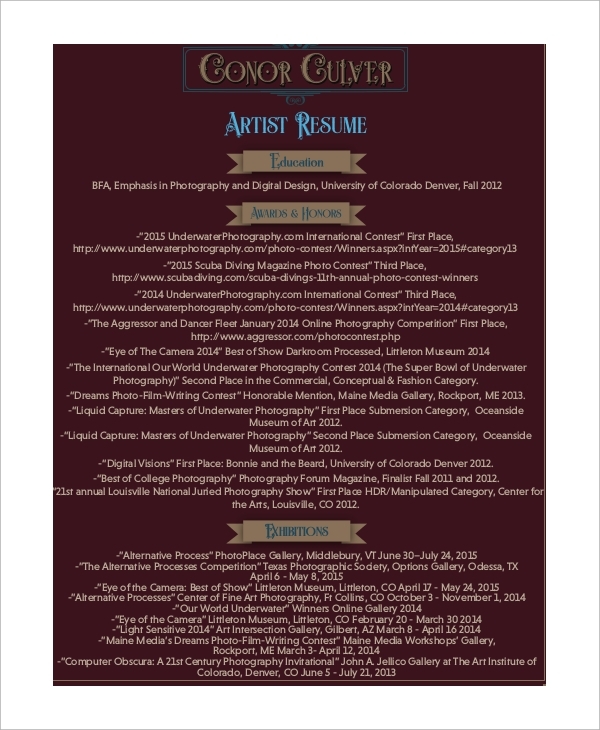 This resume starts off with the personal and contacts information of the artist. Then the objectives are listed up, followed by experience and qualities. If you are a senior artist, you can follow the chronological style. Junior artists can start the resume with the training period, and you can include some of your remarkable achievements in this phase. Then the resume enlists the accomplishments in the professional career, skills interests and awards. 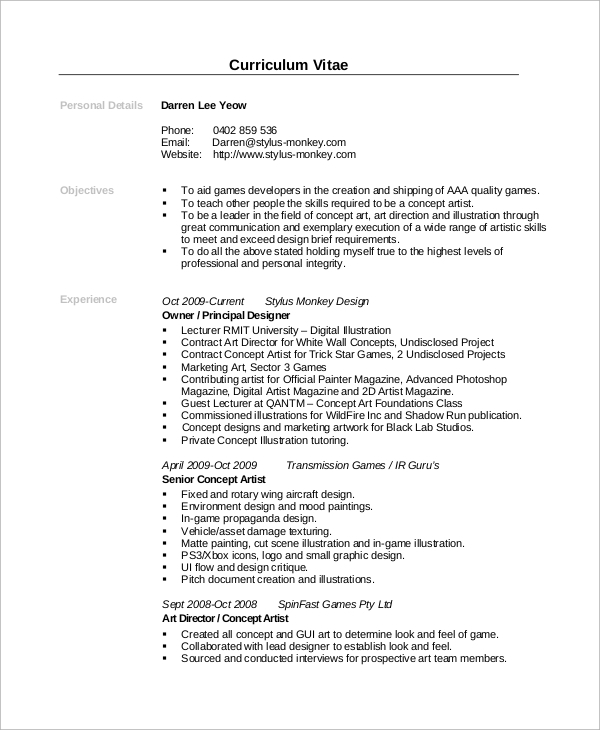 You can also see the Designer Resume Samples. 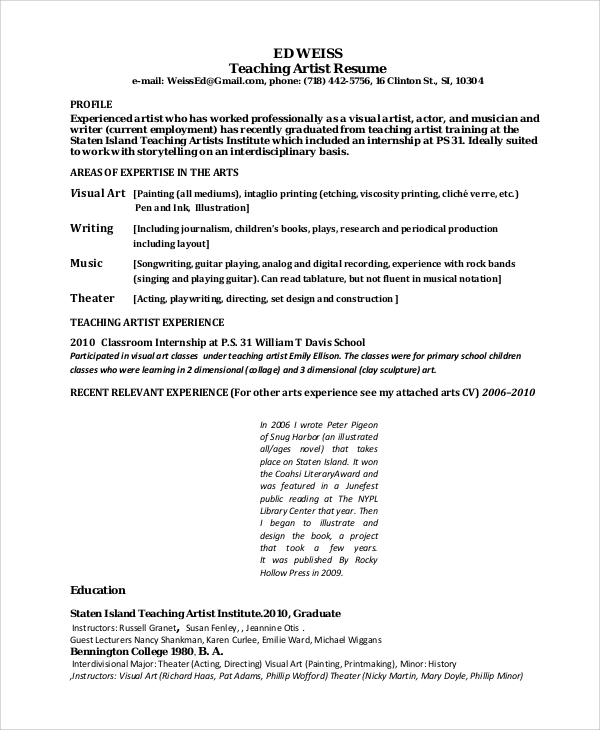 The resume contains the education, experience and abilities of the artists. Mention the artistic skills you possess and enlist the names of exhibitions where you appeared. You can also mention your technical skills related to your profile. 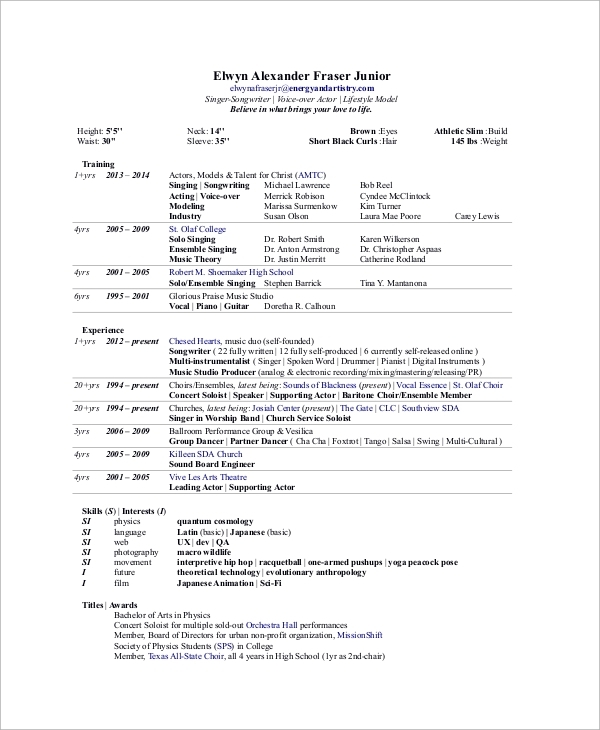 You can also see the Acting CV Samples. 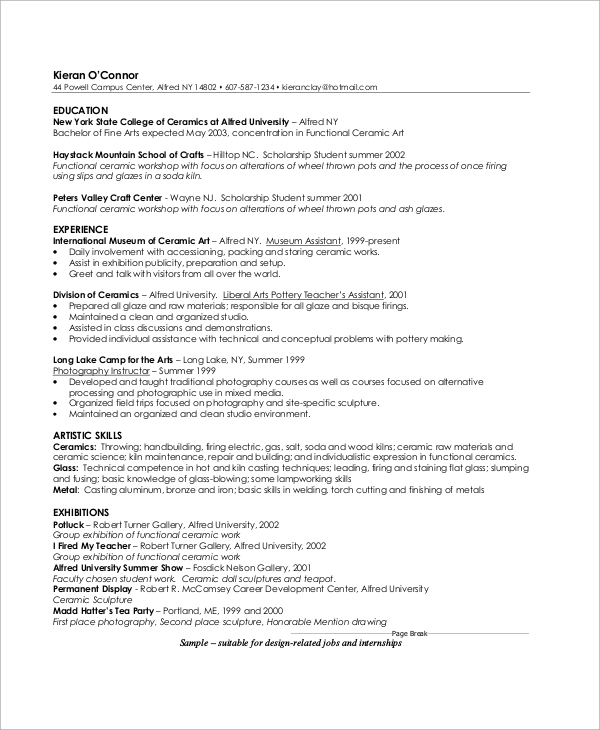 Why do you need a Good Artist Resume? So, when you develop your Resume Samples, make sure that you mention what makes you different from others. Different organizations need different profiles of artists, according to the circumstances. For small programs, organizations prefer to hire cheap artists at reasonable rates. However, if you have a lot of experience, you need to find the right platform. The awards and honors occupy a conspicuous position in the resume, right after the education sector. Here, different subheads are used to write the names of exhibitions you appeared in and overall reputation. Since experienced artists have a lot of awards and certifications, it is wise to write a chronological resume with all these accomplishments. You can write your qualities and uniqueness after this part. 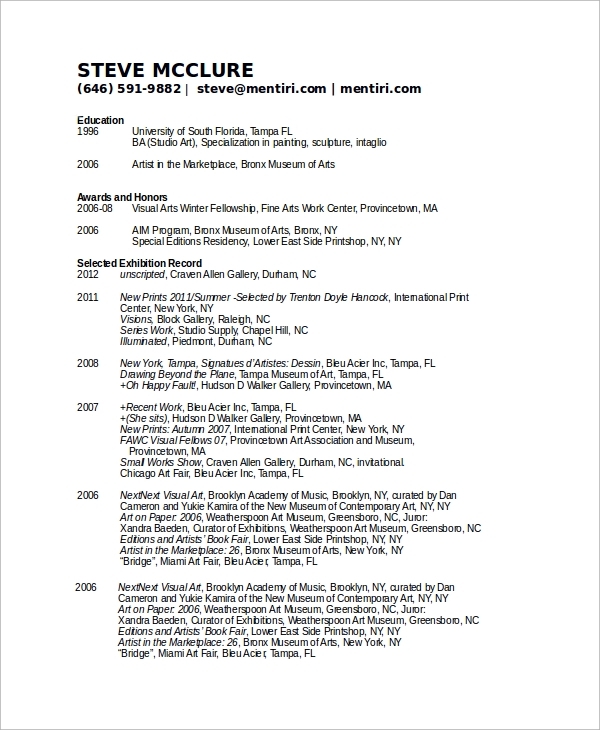 How to make an Artist Resume Effective? While crafting an artist resume, you need to be strategic and diplomatic. Focus on your past accomplishments and highlight on the differences that you can create with your performance. You need to start off with your objectives, specifying your goals in your field. This will help you to find the right organization seeking for your talent. Next, list up all your performances under separate categories. You can follow a chronological Acting Resume Samples if you want to present your experiences from beginning to end. You can also follow other formats while submitting your resume. Include a few testimonials in your resume to justify your talent. It is important to mold the resume as per the cherished lines of the organization you apply for. In the website, you will come across different variations of artist resumes, including Designer Resumes or Sample Acting Resumes. You can customize them or follow the format of any of these templates to get the right job.